A professional DAW for home recording doesn’t have to cost an arm and leg. First of all, there are many free solutions or nearly-free solutions. Like Ardour. It’s free (open source) software, if you’re using an older version that is. Like Ardour 4.x. Last week Harrison Mixbus was offering Mixbus5 for a deep discount and I just couldn’t resists. Still use Ardour for older projects but Mixbus is just an awesome product! Harrison Mixbus is a digital audio workstation (DAW) available for Microsoft Windows, Mac OS X and Linux operating systems. Mixbus provides a modern DAW model incorporating a “traditional” analog mixing workflow. It includes built in analog modeled processing, based on Harrison’s 32-series and MR-series analog music consoles. Mixbus is based on Ardour, the open source DAW, but is sold and marketed commercially by Harrison Audio Consoles (Wikipedia). Installation took some time, you really do need to do this “step by step” following the (online) manual and I had some “problems” importing old projects from Ardour sessions (I thought it was compatible, but it isn’t 100% compatible with my Ardour 4.x version). But after about 30 minutes I was already doing my first (test)recording. 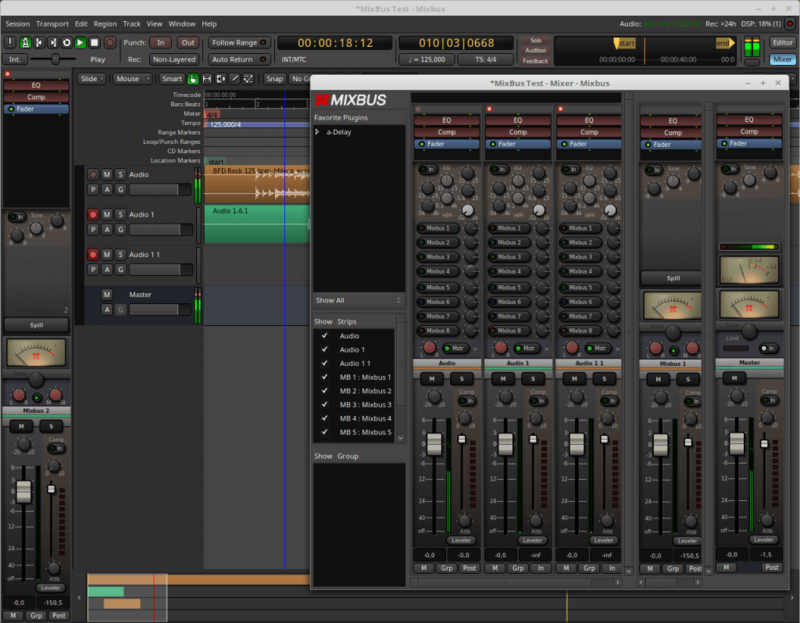 Mixbus5 looks a lot like Ardour (no surprise here!) but it’s more advanced. It’s also more demanding (CPU. Memory, Disk). Despite that, I got it workin smoothly on “light” ITX-computer using an Intel® Quad-Core Processor (J1900, 2 GHz) with 8GB RAM. On this machine I’m running Linux Mint as the OS. Mixbus comes with a ton of features, plugins and the special offer included some additional plugins! We will be moving soon to another house and there I will be having a bigger (lof)studio. Apart from a bigger room, I most certainly will need bigger monitor screens for this.. in fact, I will need/want two screens 🙂 This is just too much vor only one (small) screen. I installed Mixbus5 on my desktop computer first for testing but it didn’t run smoothly on my SATA HDD. The disk simply can’t keep up. Mind you, it’s a fast Seagate disk, but SATA just can’t handle it too well. My dedicated “DAW-computer” (the ITX) has an SSD disk and it runs smoothly. I did have time-outs sometimes, so I’ve installed a little utillity on my Linux ITX computer to prevent it from going in to “sleep” mode and have more performance (full cpu-usage). This fixed the time-outs. I was planning to have some fun with it this weekend and perhaps create a short video about it but.. i fell ill and on top of that the power supply one of the hosting-servers died on me.. So had to go the the data center and fix that. I will post an update later!